The mid-weight FR grid fleece underwear is a flame resistant version of the polyester grid fleece underwear. It will provide improved moisture management, insulation and comfort when worn in intermediate to cold weather environments. In addition, it will provide Marines with FR protection when needed. 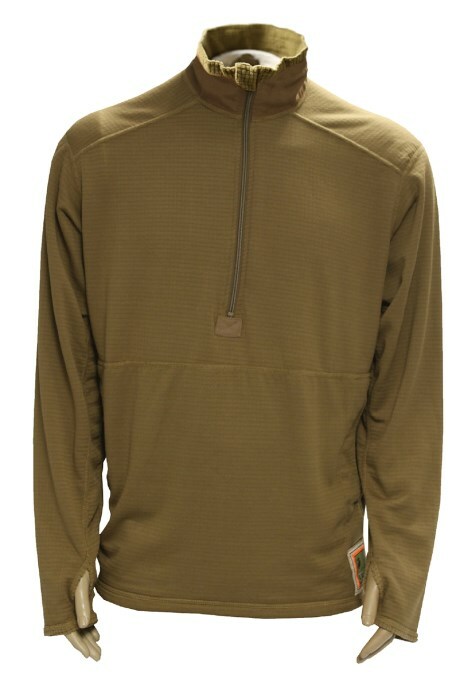 The FR Grid Fleece can be worn as part of the Mountain Cold Weather Clothing System or Flame Resistant Organizational Gear. The undershirt is a 1/2 zip design with a mock turtleneck, a lower front internal kangaroo pocket and long sleeves with a monkey paw design. The drawers have an elastic waist band, an improved fly opening and a cuff-less leg. The FR mid-weight was initially fielded in Desert Tan, but in 4Q09 will be converted to a Coyote color. 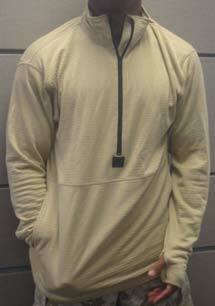 The fabric is no melt/no drip, moisture wicking, lowers bulk and improves insulation characteristics.